Not many people are aware of the existence of setting sprays, but these babies are magical, they help keep your makeup intact until the end of your day. At first, I thought it was a scam, just like any other new ''IT'' product in the makeup industry. What made me very doubtful is the fact that I had tried the MAC version, months back, which is a setting spray called Fix+. This spray did not do anything for my skin, yes it hydrates your skin and gives a nice mist of minerals but it did not set my makeup in place all day. Point, blank, period. Very disappointed. A couple of months later, I discovered that the makeup brand Urban Decay had associated themselves with Skindinavia, which is a company known for being ''the pioneers of makeup finishing spray''. They created 2 setting sprays : De Slick and All Nighter. At Sephora, they sell the mini-versions of these two sprays, which gave me the opportunity to try them both. 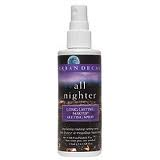 At first, I tried the All Nighter Setting Spray and I instantly fell in love, my makeup would stay intact even after a night out in a club. I grew a habit of spraying it everyday and finished the small bottle after a couple of weeks. I then decided to try the De Slick version, since I have a skin with oily tendencies, but I was disappointed. Even though this spray claims to control the oil and absorb excess sebum, I did not see a difference in my skin. The oil was still present and the makeup did not look as flawless at the end of a long day. I instantly went back to the Urban Decay All Nighter spray and haven't gone without ever since. 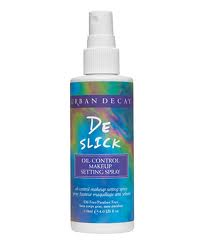 The Urban Decay De Slick may work for you, but the only way to find out is to try it. Go at your local Sephora and grab the small little bottle which runs around 14$CAN and give it a try and see which one works best for your skin. I promise, this changes everything in your makeup routine ! Go check it out ! Sounds great they have travel versions of these sprays! I use to use Fix+ too but I stopped buying it again cos I didn't notice any actual difference to my makeup! If you have oily skin....this is sent for above ;p !